Evil Nun is a scary game, similar to Granny game. In this game, your fight is against Evil Nun who has locked you in a haunted school, full of puzzles, scary items, and labyrinth-like route. To complete the game, you have to beat the Evil Nun and solve all the puzzles, and then escape the school through the exit door. Today, In this post, we have covered everything about the game you need to know: Evil Nun walkthrough, guide, and Evil Nun tips, cheats & tricks to beat Evil Nun and escape the school. The Christmas update is live and lets you escape the school through parking side. All you need to do is find these items; crowbar, yellow key, paint pot. Step 1.) Go to the bathroom/toilet side and open the first room. Head to the wall, there you will find a wooden plank. Point to the nails and use the crowbar. Once removed, go through the tunnel and you will enter another room. In that room, on the ground, point to the floor grating and move to the sewer tunnel. Step 2.) After entering the sewer tunnel, go ahead through the green side. Then point to the ladder. Now, you are on the parking side. There you will find another Nun, a car, a few more rooms, and a cabinet. Go ahead/straight and move left, there you will find a cabinet. Use the yellow key to open the closet. Pick the paint pot. Step 3.) You have to use the paint pot to mess up the clothes, in the car. Head to the back side of the car -> point to the trunk -> use it. The game will show you a message ” You have messed up the trunk’s clothes”. Now wait for a few seconds; Nun will pick it. After it, point to the trunk again and hide inside. If there is no car, then wait a few moments. And, don’t let the Nun see you. The latest version of Evil Nun has changed everything. Now, you can not directly access all the things which we mentioned in the old walkthrough. The entire game is now chapter based. To access the specific content(for example; elevator), you must be in that chapter. The developers have also pushed 1.2.1 update as there could be some bugs in the 1.2.0 update. The developers of Evil Nun have enhanced the bunker system. 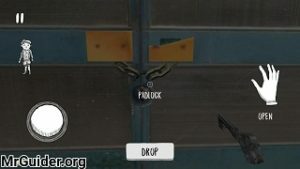 When you start the game or at the spawn point, look at the right side, there would be a hidden room; aim over the lid and press the button to go to bunker area. This is now the core of the game. If it’s closed, then you will have to wait 24 hours(until it opens). After going inside the bunker or underground, you will see a completely different perspective of the game. In the underground room, on the left side, there should be an item; grail. Pick it and place at the plinth. When you place a grail on the plinth, you will unlock/enter a chapter and the game will give you an item; it could be a black key, piece, pink key or an item. Depending on the chapter, you solve the puzzle. Once solved, you will get a mask piece. You have to place the mask piece(find 6 pieces) to complete the puzzle of mysterious mold. When you place the mask piece, you will get a new grail. The game will place it in a random place. Find it, place it on the plinth again to enter a new chapter. In this chapter, you will be able to access the elevator. If you have already read our old walkthrough, then it would be easy for you to understand. In the chapter, you will have to place the doll, crank, and dynamite in the elevator. After it, you will get the explosive doll. 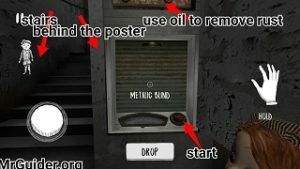 To fix the elevator, you must use the bottle of oil on it(read the old walkthrough below for more info). After getting the explosive doll, go to the second floor and find the balcony(go to the floor -> take the left turn -> open the first gate). Use the crank to make a temporary bridge for the doll. On the same screen, on the right side, hide inside the closet and use the explosive doll. That doll will explode and blast the balloons. Go to the basketball court(below the balcony) and there you will get the mask piece. Place the mask piece in the Mysterious Mould puzzle to get a new grail and access to the new chapter. In this evil nun chapter, you will get the pink key(after placing the grail in bunker room). Use that pink key to open the pink door. After it, find the chicken(Go to the basketball court -> open the trap door -> there you will find the chicken). Get the chicken and head to the Pink room again. Place it on the engine. After it, you have to find the corn(Bunch of corn). You can find it in the rooms, closets. Once found, go back to the pink room again and give it to the chicken. Use the minigun to play the minigame. Shoot the + points board. Once done, leave. And in the same room, near the board, under the rewards panel, you will get the mask piece. Place it in the Mysterious Mould puzzle to get another Grail. Find it and repeat. In this chapter, you will get a black key after putting the grail on the plinth. Use this black key to open the laboratory room, which is on the first floor. To enter the laboratory room, you must restore the electricity supply(Read our old walkthrough below for more details). After restoring the electricity supply, go to the first floor, take the left turn, then again take the left turn -> open the room -> there would be one more room(black room/laboratory room). In the laboratory room, you will see a skeleton. Put three items on it; Mannequin, eagle’s wings, and goat head. After it, make some sound there to call evil nun. Make sure to hide after making the noise. After it, Evil Nun will start praying. Go close to the skeleton and there you will find a code. Use that code to open the locked door(read the 3rd point on old walkthrough below). From there you will get the mask piece. In this chapter, you get the mask from a rat. Since rat is so fast, you will use the gums gun to stick it at a point. To get the gums gun, you need to put three items in the elevator and then run it after using the bottle of oil. These three items include; coin, gumball jar, and a gun. There is no exact location though; you will have to search manually in the library, tunnel(trap route), lockers, and rooms. After putting these items, you will have to wait for a few seconds until the elevator comes up. You will get the gums gun. And, there are high chances of interacting with the mouse on the first floor. We will update this post soon and give you a detailed Evil Nun walkthrough of the next chapters. If you have already completed, then share with other players in the comment section. Before we head to the walkthrough guide, tips, cheats & strategy guide part, let’s learn the basics first. In Evil Nun game, have to open the exit door and escape the school. But there is a key(Master Key) which is required to unlock the exit door. And this key is in the safe box. Wait! Here is one more puzzle. The safe box is inside a room(that room is locked). And the safe box is also locked. To open the safe box, you need a safe key. Any guess? Where can we find it? In the room, locker, closet, or drawers? Answer – To get the safe key, you need to beat the Evil Nun. But how to beat her? Is there any weapon? Yes! There is an explosive doll that you can use to beat Evil Nun. But there is a catch. You have to attach a dynamite with the doll(to make it an explosive doll). We will go deep into this section in the guide part. Take a deep breath! The safe box is inside the locked room. And we need a code to open it. There is no specific code or password(every time, the game generates a new password). For the first time, it was(for us) 4537. But how to get this code or password? At the top floor, there is a skeleton. You have to put three objects to it; goat head, eagle’s wings, and white blanket. After it, the skeleton will look like a devil(As per the game). Evil Nun will start praying next to the devil(after putting the objects) and a message will appear(that message contains the code or password). Just head to the locked room, enter the password. Open the safe box using the safe key and grab the master key. Use the master key to open the exit door and leave the house. So this is the basic Evil Nun game guide. Now, let’s check out our Evil Nun walkthrough, tips, cheats & strategy. (Item requirement – small cable). The exit door is behind the roller shutter door. And to open the shutter door, you have to press the switch button. Prior to it, you have to restore the electricity supply. Go to the second floor(above the ground floor). On the right-hand side, there would be a door. Open it. Now, you are in the gallery. On the wall, there is an electrical panel. Aim to the lever and tap the hand(use) icon. Make sure you have small cable in your hand. It is required to pass the current. Where to find the small cable? Answer – In the lockers, drawers, closet, and rooms. On the benches, chairs. After it, go to the exit door place(ground floor/first floor) -> tap the switch button. After it, all the shutter doors will open. To get the password, you have to find and put three objects to the skeleton(second floor). These objects are; goat’s head, eagle’s wings, and the white blanket. Goat’s head and the white blanket can be found in the toilet, in the rooms, on the benches, as a wall sculpture(goat’s head). There is an eagle mannequin in the construction area. Go to the second floor(skeleton area), on the right side, there is a window. Go there and aim over it. Tap the hand icon(use). After it, aim at the rope holding mannequin. To cut the rope, you need scissors. The scissors can be found in the lockers or on the chairs, in the rooms. There is a secret locker behind the library. Go straight towards the stairs, on the left side, go to the classroom. There is another door in the classroom. Open it. Now, you are in the library. There is another door in the library(actually, there are two; one is visible and another one is secret). Open the door. Now, you are behind the library. There are so many lockers in that place. Find the locker(with eagle stamps). Open it using the locker code. You may find a doll, item, scissors in this secret locker. In the Evil Nun game, you need dynamite. You use the dynamite with the doll to blast. The dynamite is behind the bookshelf. And to go there, you have to open the secret gateway. Go to the library. There would be a pedestal book stand. Pick the heavy book and drop it. Place the Bible on the book stand(The definitive Bible). After it, a small secret gateway to the hidden room will appear. Switch to the prone position by tapping the boy icon and go there. There you will find dynamite. After putting all the three objects on the skeleton, call the Evile Nun(make the sound and close the door, near skeleton). You can make some sound by dropping the heavy book or painting near the skeleton. After it, The Evil Nun will come(keep yourself in the room and close the door – the second floor, near the skeleton) and pray next to the devil. You will get the message – “The Evil Nun is praying for about 20 seconds”. Go close to the skeleton and check the message(note that code). After getting the code or password, go to the locked room(just left side of the room, where you spawn). Enter the code and open the door. After it, tap the start button and wait for 20 seconds until it comes up again. You will get the explosive doll from the elevator(after 20 seconds). Get the explosive doll. The Elevator Mechanics would not work as it is rusty. Use the oil to fix it. You can find this bottle(oil) in the lockers, rooms, closet. Hide inside a closet(before going inside the closet, make some sound to attract Evil Nun). Tap the doll icon to release the explosive doll. After a certain amount of time(9-10 seconds), the explosive doll will blast and the Evil Nun will go to sleep(unconscious). On her body, search for the safe key. After getting the safe key, go to the room that we unlock in the 3rd step. There is a safe box. Open it using the safe key. And get the master key. Go to the exit door location and open the padlock using the master key(just aim and tap the hand icon). Now, you are outside the school. 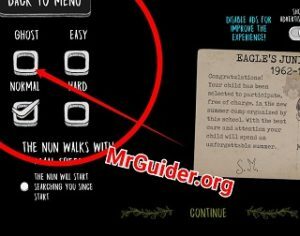 So this is a complete Evil Nun game walkthrough. Tip: – If you are having the trouble understanding the game’s mechanics, then enable the ghost mode. In the ghost mode, you are invisible and Evil Nun will not put you in the laundry room. Before you start the game, on the main screen, at the top, check the box next to ghost mode. This will help you in learning the school’s map, finding items, understanding the basic concepts. We will keep updating this post. 24-11-2018 – Bunker, Chapters, new puzzles, rooms. The Halloween theme is now live in Evil Nun game. Now there are many puzzles, items(Underwear, Sports Ball, Chicken), dialogues. Especially a chicken. However, in order to clear the game, you just have to follow the above steps. The graphics of the game has improved a lot. But the controls still stucks sometime. Hope they will fix it. What the use for crowbar in evil nun game? I always found that in every game but i dont know what the use for. You can use it to remove the plank. Head to the washroom/toilet side from basketball court route and open the first room in the lane. There you will find a wooden plank. Use the crowbar to remove it. This will open a hidden route. Where do I get a coin for the machine? @Scott There is no exact location though, but most of the time it spawns in the library, on the chair. You may also find it in the secret room(Go to the bathroom, there would be a wooden plank, aim to the nails and use crowbar). Every time you start a new game, locations of the objects get changed. Will there be a christmas update in the future? There’s a new version and I have had trouble looking for the 5th grail. You can find crank in the classroom at the first floor(in the drawers), in the wall mounted cabinets, on the bed(where you spawn), above the washbasin in bathroom. There is no exact location though. You will have to search manually. Most of the time it is found in above mentioned locations. Hello do you think you could tell me where the broom usely spawns? @Pamela In wall mounted cabinets. It usually spawns there. I ran out of corn how do I get more? @Molly There is no exact location of these items. So I can’t help. Sometimes I also face this problem and start over. These items spawn randomly in different locations. Try searching in the rooms(check all cabinets, lockers, behind the lockers), on the top floor, in bathroom side, trap routes. @Pamela Most of the time, it spawns in wall mounted cabinets. I found a yellow key and I used it one a yellow cabinet outside of the school so where you get the popcorn there is a trapdoor you go inside and here I a path and the water takes you away and it leads to another trap door then there is a van and another nun turn to your left and you will see a cabinet and inside I found a painting pot and i’m not sure of what to do with it so can someone tell me what I do next after finding it? I’ve tryed everything and for some reason my corn rarely ever shows up, I’ve tried the evil nun on another iphone and it wont work anywhere. Any idea why? Is there even a 5th / 6th grail yet. After finding 4 grails with red inside,I found the 5th, but it is blue inside. It also changed the secret bunker floor to blue. And when I place the new blue 5th grail on its plinth nothing happens. Is there a 5th chapter? I have found a few vents and a door blocked by a locker I can’t open. The basket ball dosent seem to do anything either. Please can Simone shine a light on this for me. @Ben the two more chapters are laundary day and fowl play. Both are locked yet and they will release it in upcoming update. That’s why 5th grail is not working. Can anybody help me find the cranks? I have searched and I cannot find it. I also have the new Christmas update. The gun usually spawns behind the lockers(go straight towards the stairs, right side of the library and go prone). I usually get it there, but not all the time. Crank – This one usually spawns in the rooms, classroom, cabinets (check all). But at the end, no one knows the exact location because every time you start the game, the spawn points of these objects get changed. You will have to search everywhere (every single room – take your time and look every corner, every single cabinet, and drawers). What is the broom used for? @Tray In the security room, if you look at the ceiling, you will see a trap tile. Smash it with the broom to get cookie box. If you throw it from the top floor balcony, it will blast and drop an item. Notes – The security room is near the school’s main door(pass the electricity supply). Help! We need our 6th puzzle piece and cannot find that 6th grail. We also cannot get the key off the nun, and have moved and kicked her after she is passed out from explosion. We got the doll to explode in gym and open one of those boxes instead. How do we get that key off of her, we have tried at least 10 times, and find that last grail? Help! Where do you find the corn for the chicken??? If you guys have a hard time finding the crank, Use the dynamite instead of the doll, go to the secret room, fetch a dynamite, climb up to the balcony, rotate the small bridge crank, duck and bring dynamite infront of every piñata like balloons, then fetch some torch, you need to be fast for the torch is going to be burnt like matches.